At SureThing.Com, you'll find everything you need to complete amazing disc labeling projects. From award winning CD label making software to our SuperVibrant CD labels, covers and disc packaging, we've got it all. We invite you to browse through our site and discover new ideas to make all your disc labeling projects a success! When it comes to CD and DVD labeling, the world turns to SureThing. 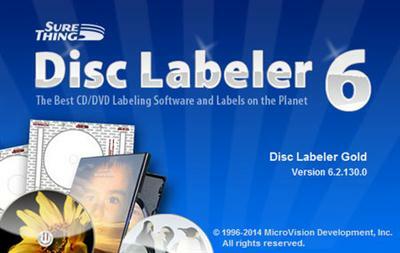 Disc Labeler makes it fun to design your cd covers, disc labels, and case inserts, all from within its easy to use and powerful label design software for Windows. Whether you're just getting started or a design professional, you've come to the right place to begin creating beautiful CD/DVD labels and case inserts for all your disc projects. Make your discs stand out from the crowd by using the best CD/DVD labels and case inserts on the planet. We use a special coating designed specifically for inkjet printers to provide the most vibrant, photo-quality matte labels possible. And when you're ready to really impress, choose our Photo Glossy labels. Either way, your projects will never look better! You'll find everything you need right here to complete your projects. We only choose reliable brands that bring you the best bang for your buck. Whether you need simple sleeves for your CDs or a full disc package with cases, discs, and inserts, we've got you covered. - Circular Text is a Snap! * Note: These are minimum requirements, is always better! The following features are available in SureThing Disc Labeler Deluxe. Not all of these features are available in other versions of SureThing Disc Labeler. Check Help > About to confirm which version of SureThing you are running. New improved drop-shadows! Create true soft drop shadows, not just offset text. Options include angle, distance, blur, and opacity. SVG image support. SVG is the new open standard for vector art. Size your art without losing resolution! New improved image engine. Speed is the key word here. High resolution images will no longer slow you down. PDF export. By popular demand, PDF export is now built right in to the print dialog. Improved interface. Shades, colors, blends, borders, and transparency options are all available right from the control strip. The most commonly used tools and options are now available on the right hand side. It's like having all your tools right where you need them, all the time. » Deciphering the "Phaistos Disk"